The Lakshmi Narasimha Temple, Nuggehalli in Hassan is an excellent example of the architectural style dominant during the Hoysala period. The temple is dedicated to Lord Narasimha who is believed to be an avatar of Lord Krishna. 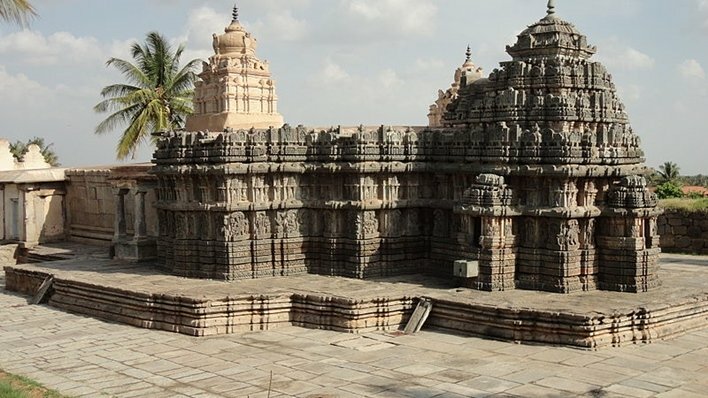 The temple was commissioned by a commander of the Hoysala army, Bommanna Dandanayaka in 1246CE. This was during the reign of King Vira Someshwara. The temple is dedicated to Lord Narasimha but also has statues of other Gods and Goddesses as well. The temple is constructed as a trikutachala i.e. it has three sanctums. 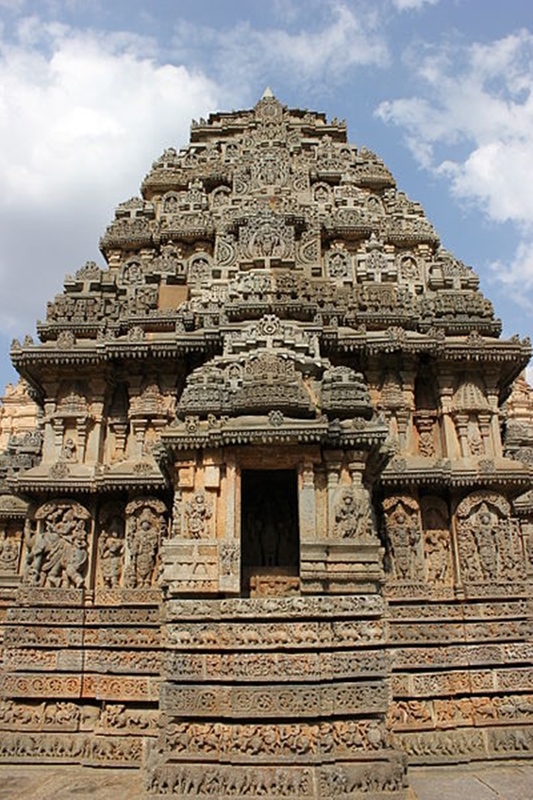 The main temple is raised with a statue of Lord Narasimha in the northern sanctum, images of Kesava in the western sanctum and images of Venugopala in the southern sanctum. The western sanctum also has images of Durga, Sarasvati and Harihara in three devakosthas. The temple follows an east-west orientation and is built primarily with soapstone. To make the temple appear larger, an open mantapa was later added on. The three sanctums open out to a central mantapa that is supported by 4 round pillars. The western sanctum is the most prominent. It has a sukanasi opening or an entrance with a superstructure or tower that leads to the main mantapa. The other two sanctums do not have such as sukanasi. The superstructure over the western sanctum is almost exactly as it was designed years ago. The eaves are decorated with ornate dentils and the architrave is marked by pilaster turrets. The walls of the Lakshmi Narasimha Temple, Nuggehalli are covered with intricate mouldings and friezes in a horizontal treatment. These friezes are taken exclusively from the Bhagavatha. The lower eaves feature images of Hindi Gods and Goddesses with their attendants. In all there are about 120 such sculptured panels. Below this, the wall is divided into 6 horizontal panels with two sections. These showcase elephant processions, horses, foliage, scenes from the Hindu epics, imaginary beasts and hamsas. The intricate work on these panels is credited to Baichoja and Mallitamma, 2 well-known sculptures of the 13th century. The roof of the temple follows a square plan and has three tiers of smaller roofs with their own kalasas. This forms the body of the main tower. Since the sukanasi has only two tiers, it appears as an extension of the main tower. This is an important pilgrimage site for Jains. The temple atop the hill has the world’s tallest monolithic statue. This granite statue of Bahubali has a height of 17.7m. A path with 650 steps leads up the statue and offers panoramic views of the hillside. Once in 12 years, the statue is bathed with milk, turmeric, sugar cane juice and rice powder. The Charmadi Ghat has one of the most beautiful drives. The road is flanked by lush greenery. These forests are known for medicinal herbs and are home to a number of endangered animals. The best time to visit here is during the monsoons. This is a small hill with about 14 Jain temples. The history of this hill is linked to Emperor Chandragupta of the Mauryan Empire. In fact, the name of this hill derives itself from the Emperor’s name since he was the first to perform penance on the hill. Bengaluru is the nearest airport to Nuggehalli (136 km). From here, one may drive down in a car or take a taxi to the temple. Channarayapatna is the closest railway station (20 km). Buses and taxis ply regularly from the station to the temple. Nuggehalli is well connected to Channarayapatna by road. From here, KSRTC buses run regularly. Alternatively, taxis are also available.